A catamaran (from Tamil கட்டுமரம் "kattumaram") is a type of multihulled boat or ship consisting of two hulls, or vakas, joined by some structure, the most basic being a frame, formed of akas. Catamarans can be sail- or engine-powered. Catamarans are a relatively recent introduction to the design of boats for both leisure and sport sailing, although they have been used since time immemorial among the paravas, a fishing community in the southern coast of Tamil Nadu, India, and independently in Oceania, where Polynesian catamarans and outrigger canoes allowed seafaring Polynesians to settle the world's most far-flung islands. In recreational sailing, catamarans, and multihulls in general, had been met by a degree of skepticism from Western sailors accustomed to more "traditional" monohull designs, mainly because multihulls were based on, to them, completely alien and strange concepts, with balance based on geometry rather than weight distribution. However, the catamaran has arguably become the best design for fast ferries, because their speed, stability and large capacity are valuable. There are three terms that describe the components of modern multihulls. The term vaka, like the related terms aka and ama, come from the Malay and Micronesian language group terms for parts of the outrigger canoe, and vaka can be roughly translated as canoe or main hull. Aka – The aka of a multihull sailboat is a member of the framework that connects the hull to the ama(s) (outrigger). The term aka originated with the proa, but is also applied to modern trimarans. Ama – The term ama comes from the proa. The vaka is the main hull, the ama is the outrigger, and the aka or iako (Hawaiian) is the support connecting the two (not three) hulls. The term ama and aka have been widely applied to modern trimarans. Vaka – A proa consists of a vaka, the main canoe-like hull; an ama, the outrigger; and akas, the poles connecting the ama to the vaka. Catamarans and trimarans share the same terminology, with a vaka, ama, and aka. Semantically, the catamaran is a pair of Vaka held together by Aka, whereas the trimaran is a central Vaka, with Ama on each side, attached by Aka. The above section reflects American usage. In the UK these terms are seldom used. While the English adventurer and buccaneer William Dampier was traveling around the world in the 1690s in search of business opportunities, he found himself on the southeastern coast of India, in Tamil Nadu on the Bay of Bengal. He was the first to write in English about a kind of vessel he observed there. It was little more than a raft made of logs. On the coast of Coromandel," he wrote in 1697, "they call them Catamarans. These are but one Log, or two, sometimes of a sort of light Wood ... so small, that they carry but one Man, whose legs and breech are always in the Water. Although the name came from Tamil, the modern catamaran came from the South Pacific. English visitors applied the Tamil name catamaran to the swift, stable sail and paddle boats made out of two widely separated logs and used by Polynesian natives to get from one island to another. The design remained relatively unknown in the West for almost another 200 years, until an American, Nathanael Herreshoff, began to build catamaran boats of his own design in 1877 (US Pat. No. 189,459), namely 'Amaryllis', which immediately showed her superior performance capabilities, at her maiden regatta (The Centennial Regatta held on June 22, 1876, off the New York Yacht Club's Staten Island station). It was this same event, after being protested by the losers, where Catamarans, as a design, were barred from all the regular classes and they remained barred until the 1970s. This ban relegated the catamaran to being a mere novelty boat design until 1947. In 1947, surfing legend, Woodbridge "Woody" Brown and Alfred Kumalae designed and built the first modern ocean-going catamaran, Manu Kai, in Hawaii. Their young assistant was Rudy Choy, who later founded the design firm Choy/Seaman/Kumalae (C/S/K, 1957) and became a fountainhead for the catamaran movement. The Prout Brothers, Roland and Francis, experimented with catamarans in 1949 and converted their 1935 boat factory in Canvey Island, Essex (England), to catamaran production in 1954. Their Shearwater catamarans won races easily against the single hulled yachts. The speed and stability of these catamarans soon made them a popular pleasure craft, with their popularity really taking off in Europe, and was followed soon thereafter in America. Currently, most individually owned catamarans are built in France, South Africa, and Australia. In the mid-twentieth century, the catamaran inspired an even more popular sailboat, the Beach Cat. In California, a maker of surfboards, Hobie Alter produced the 250-pound Hobie Cat 14 in 1967, and two years later the larger and even more successful Hobie 16. That boat remains in production, with more than 100,000 made in the past three decades. The Tornado catamaran was an Olympic class sailing catamaran, with a crew of two. It has been in the Olympic Games since 1976. It was designed in 1967 by Rodney March of Brightlingsea, England, with help from Terry Pierce, and Reg White, specifically for the purpose of becoming the Olympic catamaran. At the IYRU Olympic Catamaran Trials, it easily defeated the other challengers. Other important builders of catamarans are Austal and Incat, both of Australia and best known for building large catamarans both as civilian ferries and as naval vessels. 2 main types of catamaran exist: the regular catamaran and the open catamaran, which features a trampoline between the hulls instead of plating. The normal catamaran multihull, powered or not, consists of two Amas separated by two Akas, which may suspend a platform or trampoline between them. They can be of various sizes and recently, have become very large. The hydroairy ship appears to be nothing more than an upgraded and enlarged pontoon boat with a formed and shaped underplatform. The general architecture is identical, consisting of two flotation chambers, for the Amas, joined by a load carrying platform, which carries the superstructure. Invented in 1952 by a Minnesota farmer, in the rural town of Richmond, MN. Ambrose Weeres had an idea that if you put a wooden deck on top of two columns of steel barrels welded together end to end, you would have a sturdy deck that would be more stable on a lake than a conventional boat. This was Ambrose Weeres, walking the same idea paths as the early Polynesians, while proving that the ideas behind the multihull are not all that counter-intuitive. These sorts of boats are cheap and easy to make, require no ballast, and thus have good performance. Although this design is almost exclusively restricted to power boats, it is still essentially a catamaran. No displacement is lost towards ballast, therefore yielding huge operational efficiencies. The Small Waterplane Area Twin Hull (SWATH) is a hull form used for vessels that require a ship of a certain size to handle in rough seas as well as a much larger vessel. An added benefit is a high proportion of deck area for their displacement—in other words, large without being heavy. The SWATH form was invented by Canadian Frederick G. Creed, who presented his idea in 1938 and was later awarded a British patent for it in 1946. It was first used in the 1960s and 1970s as an evolution of catamaran design for use as oceanographic research vessels or submarine rescue ships. The S.W.A.T.H. theory was further developed by Dr Thomas G. Lang, inventor of improvements to the semi-submerged ship (S3) in about 1968. Basically, a SWATH vessel consists of two parallel torpedo like hulls attached to which are two or more streamlined struts which pierce the water surface and support an above water platform. The US Navy commissioned the construction of a SWATH ship called the 'Kaimalino' to prove the theory as part of their ship research program. The Kaimalino has been operating successfully in the rough seas off the Hawaiian islands since 1975. Small recreational catamarans are typically designed to be launched and landed from a beach. They will come to rest on their keels without heeling over like a monohull. Additionally, their rudders can be retracted to the depth of their keels, which protects the fragile rudders from damage when the vessel is run aground. Larger Catamarans make good cruising and long distance boats: The Race (around the world, in 2001) was won by the giant catamaran Club Med skippered by Grant Dalton. It went round the earth in 62 days at an average speed of eighteen knots. Catamarans can be harder to tack if they don't have dagger boards or centre boards. All sailboats must resist lateral movement in order to sail in directions other than downwind and they do this by either the hull itself or else dagger boards or centre boards. Also, because catamarans are lighter in proportion to their sail size, they have less momentum to carry them through the turn when they are head to wind. Correct use of the jib sail (back-filling the jib to pull the bow around) is often essential in successfully completing a tack without ending up stuck in irons (pointing dead into the wind and sailing backwards, see: No-Go Zone). They have a higher speed than monohulls of the same size due to the more needle-like hull shape having reduced hydrodynamic drag. Catamarans are slower turning than monohulls as hull spacing is increased and hulls are narrowed to a more needle like shape. Catamarans are less likely to capsize in the classic "beam-wise" manner but often have a tendency to pitchpole instead—where the leeward (downwind) bow sinks into the water and the boat 'trips' over forward, leading to a capsize. Teaching for new sailors is usually carried out in monohulls as they are thought easier to learn to sail, a mixture of all the differences mentioned probably contributes to this. The major increase in speed over a monohull is due to the hull shape. A monohull with a traditional displacement hull has a quickly building hydrodynamic drag barrier which set the theoretical hull speed based on square root of "length at waterline". Catamarans make use of needle like hulls which significantly reduce this source of friction. Catamarans are typically lighter and thus have less displacement and drag. This is because they don't require a keel counterweight since righting moment is derived from the spacing between multiple hulls. Catamarans have a wider beam (the distance from one side of the boat to the other), which makes them more stable and therefore able to carry more sail area per unit of length than an equivalent monohull. The greater stability means that the sail is more likely to stay upright in a gust, drawing more power than a monohull's sail which is more likely to heel (lean) over. A catamaran is most likely to achieve its maximum speed when its forward motion is not unduly disturbed by wave action. This is achieved in waters where the wavelength of the waves is somewhat greater than the waterline length of the hulls, or it is achieved by the design piercing the waves. In either case pitching (rocking horse-like motion) is reduced. This has led to it being said that catamarans are especially favourable in coastal waters, where the often sheltered waters permit the boat to reach and maintain its maximum speed. An increasing trend is the deployment of a catamaran as a high speed ferry. The use of catamaran for high speed passenger transport was pioneered by Westermoen Hydrofoil in Mandal, Norway, who launched the Westamaran design in 1973. The Westamarans, and later design, some of them consisting of a catamaran hull resting on an air cushion between the hulls, became dominant for all high speed connections along the Norwegian coast. They could achieve speeds comparable to the hydrofoils that it replaced, and was much more tolerant of foul water and wave conditions. There is a list of catamaran ferry routes documenting the growing number of routes. A recent development in catamaran design has been the introduction of the power catamaran. The 'power' version incorporates the best features of a motor yacht and combines it with the characteristics of a multihull. Usually, the power catamaran is devoid of any sailing apparatus as demonstrated by one of the top-selling models in the United States, the Lagoon Power 43. This vessel has now been introduced to a number of charter fleets in the Caribbean and the Mediterranean and is becoming an increasingly common sight. Smaller powered catamarans are becoming quite common in the United States with several manufacturers producing quality boats. A small "cat" will almost certainly have 2 engines while a similar sized mono-hull would only one engine. All mid-size and larger cats will have 2 engines. The Swiss-registered catamaran Tûranor PlanetSolar which was launched in March 2010, is the world's largests solar powered boat and is planned to circumnavigate the globe. Below a minimum size, about 8 m (24 ft), the catamaran's hulls do not have enough volume to allow them to be used as living space. At the same time, the bridgedeck area isn't sufficiently sized to make effective live-aboard space either. There are a lot of folks doing long-distance offshore cruising in monohull yachts of 9m (30 ft) and less. No responsible designer or multihull sailor would recommend this for a multihull. 12m (40 ft) is the minimum recommended LOA and 15m (50 ft) is preferred. This size allows adequate storage for necessary cruising equipment and still give you a good turn of speed in comfort and safety. ... If 15m (50 ft) sounds enormous, remember that the weight of a multihull, of this length, is probably not much more than half the weight of a monohull of the same length and it can be sailed with less crew effort. While more popular in the EU, they are gaining popularity in the US as well. These boats can maintain a comfortable 300 nmpd (nautical miles per day) passage, with the racing versions recording well over 400 nmpd. In addition, they don't heel more than 10-12 degrees, even at full speed on a reach. 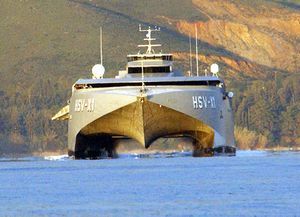 HSV-1 Joint Venture, a large, experimental, high-speed military catamaran. One of the biggest developments over the last decade in the yachting arena has been the rise of the super catamaran: a multihull over 100 feet in length. Various international manufacturers are leading the way in this area including Incat, Blubay, Yapluka, Blue Coast Yachts, Sunreef Yachts, Lagoon and Privilege. Allures, a yacht-catamaran of more than 100 feet was launched in 2007 at Blubay Yachts, France and refeted by Coste Design&Partners. A catamaran of 150 feet in length is under construction at Derektor shipyards in Bridgeport, Connecticut. Coste Design&Partners are preparing a power yacht-catamaran of 203 feet. This project called Event Cat will be a luxury yacht dedicated to corporate and private events. Coste Design&Partners and the designer Jean-Jacques Coste are working on a full range of yachts-catamarans between 80 and more than 200 feet in length. The emergence of the super or mega catamaran is a relatively new event akin to the rise of the mega or super yacht, used to describe the huge growth in luxurious, large motor yachts on the French Riviera and Floridian Coast. One of the reasons for increased mega catamaran construction was "The Race", a circumnavigation challenge which departed from Barcelona, Spain, on New Year's Eve, 2000. Because of the prize money and prestige associated with this event, four new catamarans (and two highly modified ones) over 100' in length were built to compete. The largest, "PlayStation", owned by Steve Fossett, was 125' long and had a mast which was 147' above the water. Virtually all of the new mega cats were built of pre-preg carbon fiber for strength and the lowest possible weight. Top speeds of these boats can approach 50 knots. HSC Tarifa Jet, Large, commercial high-speed catamaran ferry. Search Wiktionary Look up catamaran in Wiktionary, the free dictionary. ↑ "catamaran". Online Etymology Dictionary. 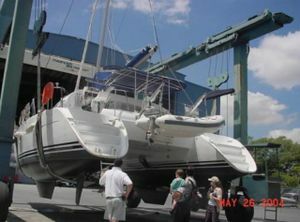 http://www.etymonline.com/index.php?term=catamaran. Retrieved 2008-09-04. ↑ 2.0 2.1 2.2 L. Francis Herreshoff. "The Spirit of the Times, November 24, 1877 (reprint)". Marine Publishing Co., Camden, Maine. http://web.archive.org/web/20080124161749/http://www.ulstc.org/Herreshoff.html. ↑ 3.0 3.1 3.2 3.3 3.4 "A primer on proas". http://proafile.com/view/weblog/comments/a_primer_on_proas/. Retrieved 2007-10-30. ↑ "The Tridarka Raider". http://www.tridarkaraider.com/. Retrieved 2007-10-30. ↑ The UCI later created this same sort of ban, in 1934, when it invalidated Faure's record of 45km in one hour, in 7 July 1933, on a Recumbent bicycle, with rule changes specifically designed to exclude the Recumbent bicycle, where Recumbent bicycle technology was similarly repressed. ↑ Weeres History - "An Idea that Started an Industry"
↑ "Frequently Asked Questions on Multihulls". http://www.f-boat.com/pages/faq.html. ↑ Jim Howard, Charles J. Doane. Handbook of offshore cruising: The Dream and Reality of Modern Ocean Cruising. Sheridan House, Inc.. pp. 280. ISBN 1574090933. http://books.google.ch/books?id=NB4uFQuUlnEC&hl=en. C. A. Marchaj. Aero-Hydrodynamics of Sailing. Tiller Publishing. ISBN 1888671181. http://books.google.ch/books?id=KYUDAAAACAAJ&dq=Aero-hydrodynamics+of+Sailing&lr=lang_nl%7Clang_en&hl=en. C. A. Marchaj. Sail Performance. McGraw Hill. pp. 400. ISBN 0071413103. http://books.google.ch/books?id=Z7JIAAAACAAJ&dq=Sail+Performance&hl=en. C. A. Marchaj. Seaworthiness:The Forgotten Factor. Tiller Publishing. pp. 372. ISBN 1888671092. http://books.google.ch/books?id=uLz2IAAACAAJ&dq=seaworthiness&hl=en. Catamaran Sailing at TheBeachcats.com Site devoted to all types of small catamarans known as beachcats. This page was last edited on 12 July 2010, at 16:06.